This book’s a real treat. For me, this is the story which I associate more strongly with Christmas than any other. It’s a classic and one which I think anybody can enjoy. I do like to keep my reviews completely spoiler free, but since A Christmas Carol is such a well known story, I’m almost unsure about what actually constitutes a spoiler this time, but I shall try my hardest nonetheless! 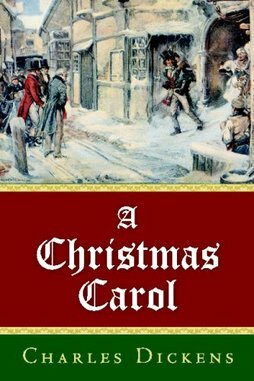 The story follows a man called Ebenezer Scrooge who’s basically just a miserable, greedy, old business man who hates Christmas. He’s particularly bitter about having to give Bob Cratchit (his clerk) the day off for Christmas and rude to charity collectors who pay him a visit on Christmas Eve. He doesn’t care about anyone and nobody cares about him and when he gets home that night he has a ghostly visitation which might just change is whole life! The story may be a bit predictable (which is probably just because it’s so ingrained in my mind) but that doesn’t change the fact that is a hugely enjoyable tale. As I read through, there are moments where I’ll laugh, moments when I’ll smile at the niceness of things and moments when I’ll feel excited and Christmassy. As horrible as he is at the start of the book, I still find Scrooge to be quite funny in how extreme his disregard of others can be. I think it’s quite intentionally comical at times. Also, with the talk of the weather and of all the delicious Christmas food, reading this is certainly a ‘sure fire’ way to get me into the festive spirit. So I wholeheartedly recommend this book. It may be a little on the short side, but at least that means it’s nice and compact. You could easily read it all in December in the build up to Christmas. And it’s full to the brim with humour, warmth and colourful characters; Scrooge, Fan, Fred and the Ghost of Christmas Present are all highly memorable. Plus, with the ghostly side of it, it’s even quite creepy at times, so, there really is quite a range of emotion packed into this book.